Hi, I am interested in your 1967 Chevrolet Chevelle SS (stock #4675-ATL) listed on Autotrader for $62,995. I'd like to get more information about this vehicle and confirm its availability. A fresh looking, vital first generation Chevelle is always a welcome sight and this 1967 Chevrolet Chevelle SS 396 certainly is just that. 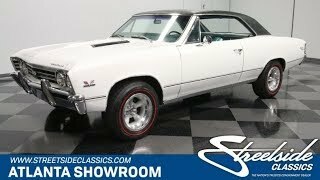 Its about as impressive an example of a Super Sport Chevelle in its original form as youre likely to see anytime soon and combines its vintage appearance with big block power under its hood thats performing in top notch fashion. As an authentic Super Sport - no rebadged sleight of hand involved here - this Chevelle first represented Chevy in the muscle car battles of the mid-60s and actually evolved to become a series of its own just a year before this 67 came out. It proudly wears that heritage via badging on all four sides - the Super Sport script on its rear fenders is particularly distinctive. Its Ermine White shade matches its original color and is in great shape - it was freshened only a few years back. Take a lap around this classic and youll notice that, save for its aftermarket wheels, it remains in stock configuration - a fitting confirmation of just how cool this car was to begin with. The cabin is surrounded by clear glass and topped with a fresh-looking black vinyl top that still has its deep black coloring and shows no bubbling. And all of that commemorative badging as well as the trim and the bumpers both fore and aft are in great shape. Its a well fitted classic to boot, with body panels that blend together well and show nice, even gaps around the hood, doors and deck lid. The turquoise interior is not only still in its original configuration but its also in outstanding shape. Take a closer look and youll see the distinctive texture of the vinyl surfaces inside is a little different than the norm of the era and does a good job of mimicking leather. The ultra-clean look of everything inside the doors gives the impression that time came to a standstill for this classic - the upholstery looks just as it did when new and the matching carpet below as well as the trim and overall fit and finish are just as impressive. The dash area is another high point for this Chevy, as its also looking great. The assortment of factory gauges in the instrument cluster are all functional and are joined by an aftermarket tach, and the dash pad shows no signs of cracking. The trunk area is in just the condition you would expect based on the rest of the car - with a full size spare inside and solid floors and a solid rubber seal sitting under the deck lid to keep the elements from intruding. The period correct 396 cubic inch V8 beneath the hood wears a chrome air cleaner and a pair of chrome valve covers and remains in factory configuration - it already packed a pretty strong punch upon leaving the factory, after all. Its running great and sits in a very clean engine bay - the firewall and inner fenders dont even show a hint of grime - while teaming with a smooth-shifting automatic transmission to provide a very solid driving experience. Unlike most of its muscle car counterparts, Chevelles of this era already featured coil springs in back, so its ride is also smooth and suffers from none of the clattering and binding that often come with leaf springs. Power steering makes for easy navigation, while power brakes - with discs up front - provide easy, low-effort stops as this classic Chevy cruises on its set of 15 American Racing tires outfitted with Mastercraft tires that look nearly new. These first generation Chevelles are getting harder and harder to find and examples like this 1967 Chevrolet Chevelle SS 396, with its strong running condition and eye-catching appearance are downright rare. Call today!